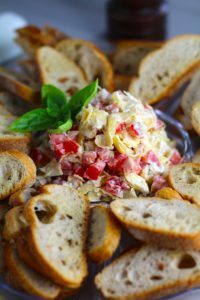 This Bruschetta Topping is creamy and fresh and tangy and is simply the best appetizer your guests will not be able to get enough! SCROLL DOWN TO SEE THE VIDEO SHOWING HOW EASY IT IS TO MAKE! 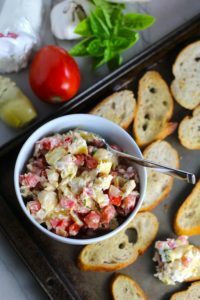 It combines fresh tomatoes, artichoke hearts, garlic, basil, olive oil, and GOAT CHEESE! Top it on toasted garlic baguette slices and you get fresh bright flavors with both crunch and creamy in every bite. Guests seriously LOVE this appetizer! It’s also really easy to make and easy to serve, which takes it from great, to BEST in my book! 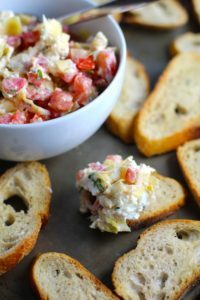 Bruschetta Topping for Appetizers or Dinner! I love the traditional bruschetta topping of tomatoes, garlic, basil, and olive oil. However, adding the artichoke hearts and goat cheese bring tang and creaminess that really transform this dish into something amazing. I have also deconstructed this appetizer so the toasted baguette slices are on the side and guests can serve themselves. 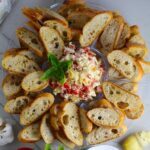 These is fantastic because 1. you don’t have to serve and you can enjoy your party and 2. the bread doesn’t get soggy sitting with the topping on it, as guests will make-to-eat. 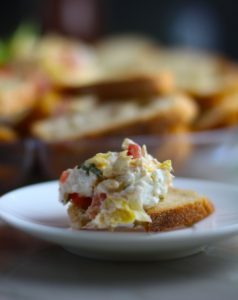 You can also use this Bruschetta Topping over chicken that you have seared and cooked in a skillet or baked in the oven. You can serve it mixed with pasta. I love it stuffed into Portabella Mushrooms or Zucchini Boats. It’s also great in a sandwich! See how EASY this is to make! You serve on a platter so that guests can help themselves and you can enjoy the party! The first thing you want to do for this recipe is get the baguette sliced and toasted in the oven. Slice the baguette on a bias in about 1/3 to 1/2 inch thick slices. Lay all of the slices out flat on a sheet pan or two pans if needed. Spray all of the slices with or brush on Extra Virgin Olive oil. I love my Sonica Organics Oil Sprayer for this because it is non-aerosol (no toxins and propellants) and is so easy to pump, then spray evenly across all of the slices without using too much. Sprinkle Salt lightly over all of the slices. Then flip each baguette slice over and spray again with olive oil. Cut the end of the garlic clove off and rub the exposed end of the clove on each slice. Then sprinkle this side with salt. Bake in the oven for 10 minutes and then flip each slice over and bake for another 10 minutes until golden toasted. I love to use Plum Tomatoes in this recipe. Plum tomatoes are easy to seed, easy to dice, and they are sold in bulk for a very reasonable price. They are also sweet and delicious in this topping. 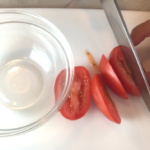 Simply slice off the 4 sides (or cheeks) of the tomato, then remove the seeds with your finger as shown in the video. Discard the seeds. Then dice and add to the bowl. Next, dice the artichoke hearts. I use canned artichoke hearts and discard the very tips of the leaves as they can be tough. Since this recipe is not cooked, I discard them as there is no other cooking opportunity to soften them. Then dice the rest of the heart. Add them to the tomatoes. Fresh Basil brings so much fantastic freshness and flavor to this recipe. Do you grow Basil indoors? This is a wonderful herb to have on hand all year long! It’s also a great gift!! Check out this Indoor Herb starter kit as a gift for yourself or someone else! It includes Organic, Non GMO Herb Seeds – Basil, Thyme Parsley, Cilantro. Also includes Potting Soil, Pots, Scissors. Finely slice or chiffonade the basil and add it to the tomatoes and artichokes. Then mince the garlic and add that next. HACK: When you buy a head of garlic, mince all of the cloves at once and then freeze the minced garlic, so you always have it on hand! 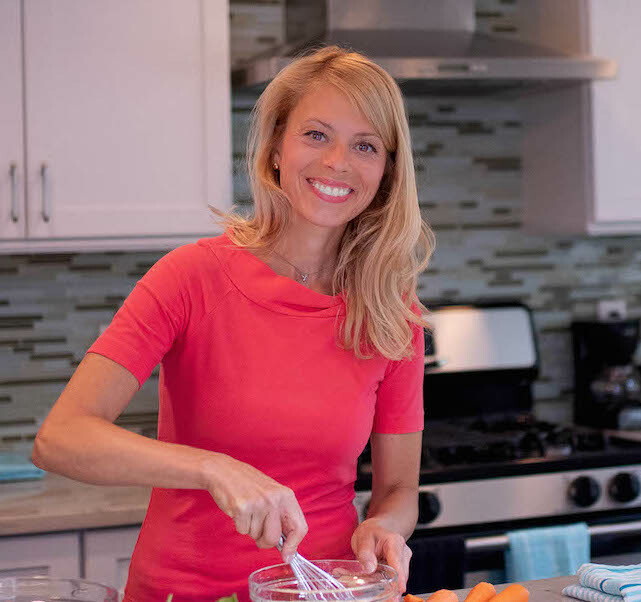 For more Freezer Hacks to make meal prep easier, download this FREE FREEZER HACK SHEET! Add the Olive Oil, salt, and pepper and mix! After everything is mixed thoroughly, use a fork to scrape in crumbles of goat cheese. 5 ounces of cheese seems like the perfect mix of creaminess to the tang and sweetness from the tomatoes and artichoke hearts, but of course, feel free to add more or less as you desire. Mix the goat cheese in just until combined. If you over mix, the cheese will blend in too much melting into the topping. I like to stop mixing when there are still nice chunks of cheese! Add the topping to a serving bowl and surround with the toasted baguette slices. 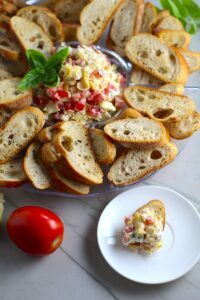 This Bruschetta Topping irresistible! 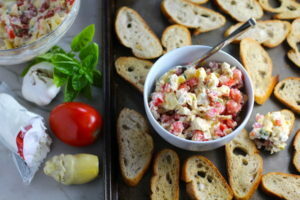 It combines fresh tomatoes, artichoke hearts, garlic, basil, olive oil, and GOAT CHEESE! Top on toasty garlic crostini and you get fresh bright flavors with both crunch and creamy in every bite. Slice the baguette on a bias in about 1/3 to 1/2 inch thick slices. Lay all of the slices out flat on a sheet pan or two pans if needed. It's ok if the slices touch. Then spray all of the slices with or brush on Extra Virgin Olive oil. Sprinkle Salt lightly over all of the slices. Then flip each baguette slice over and spray again with olive oil. Cut the end of the garlic clove off and rub the exposed end of the clove on each slice. Then sprinkle this side with salt. Bake in the oven for 10 minutes and then flip each slice over and bake for another 10 minutes until golden toasted. Remove and let rest to cool. 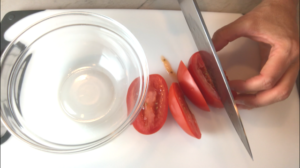 Simply slice off the 4 sides (or cheeks) of the tomato, then remove the seeds with your fingers as shown in the video. Discard the seeds. Then dice and add to the bowl. Add the topping to a serving bowl and surround with the toasted baguette slices. Enjoy!! 1 Serving = 1 Small Crostini (toasted baguette slice) with Bruschetta topping. You may get more or less servings depending on how generous guests are with loading their toppings on. What fantastic ingredients that are full of flavor in this recipe of yours. And what a perfect idea for all the holiday parties coming up. I LOVE simple but tasty foods and this looks like it delivers on both! Thanks for the post. I have a dinner guest who doesn’t like goat cheese. What else could I use? This dish is easy and delicious! My whole family loved it, even my (not-so-adventurous taste-wise) kids. The goat cheese is a great addition and makes the bruschetta heartier and more satisfying. We had it as a side but it would also be good as a light meal on a busy night. Thanks, Carrie!